The HCG Diet Gourmet Cookbook provides recipes for dieters who are following the HCG diet. It was created by Tammy Skye, who has a medical background as a Physical Therapist Assistant and regards herself as a dedicated “foodie”. Tammy Skye has lost almost 60 pounds on the diet. The book begins with an explanation of the HCG diet, which involves supplementation with HCG (Human Gonadotrophic Hormone). Dieters have the option of using sublingual HCG or injections. HCG is used in combination with a low carbohydrate diet providing only 500 calories a day. Dieters can expect to lose up to a pound a day on this protocol. Prior to commencing the diet you begin by eating high-fat foods for two days. Then you will use HCG for 23 or 43 days with the very low calorie diet. Theoretically this protocol resets the hypothalamus, which repairs metabolism. The next phase is called “stabilization” where you eat a normal calorie intake, while still restricting your intake of starches and sugars. Following this you move onto the maintenance phase where you can gradually introduce carbohydrate-containing foods back into your diet. A variety of recipes are provided for salads, appetizers, soups, chicken entrees, beef entrees, seafood entrees, vegetables and desserts. All of the recipes are very low in calories, with an average of 150-200 calories per serving. Chicken breast, beef, veal, white fish, lobster, crab, shrimp, low fat cottage cheese, spinach, celery, tomato, onion, cucumber, asparagus, cabbage, apple, orange, grapefruit, strawberry, stevia, cinnamon, ginger, turmeric, basil, cocoa, @Bragg’s liquid aminos@, hot sauce, tea, coffee, mineral water. It is not recommended to exercise heavily while on the HCG phase of the diet. Light exercise such as walking, stretching, yoga and rebounding can be beneficial. Once you progress to the stabilization phase you can add in aerobic and weight training exercise if you want to, but this is not regarded as essential. 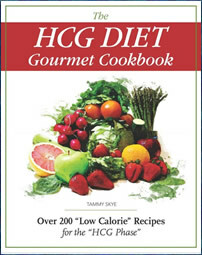 The HCG Diet Gourmet Cookbook: Over 200 “Low Calorie” Recipes for the “HCG Phase” retails at $24.95. Also available is The HCG Diet Gourmet Cookbook Volume Two: 150 MORE Easy and Delicious Recipes for the HCG Phase (Volume 2) for $24.97. Click here to purchase these titles online. Includes unique information about the use of HCG. Provides a variety of recipes for dieters following the HCG diet. Low carb diets reduce appetite. HCG can cause side effects including hunger, fatigue and lightheadedness. First phase of the diet is extremely restrictive. Advocates a “quick-fix” approach to weight loss. Does not encourage regular exercise. Calorie allowances are far lower than those generally accepted as healthy. A meal plan is not provided. The HCG Diet Gourmet Cookbook will help keep meals more interesting for those following this diet. The HCG recipes are designed specifically to meet the requirements of the HCG diet containing on average 150-200 calories per serving. This protocol is known for producing rapid results, however, dieters must be aware of the potential negative side effects of HCG. Additionally the diet is extremely restrictive and much lower in calories than is generally recommended for healthy weight loss.